In a conventional tank-type water heater, energy is required to heat the water in the tank and to keep it hot to be ready to use. In tankless water heaters, energy is only consumed when needed. Saves Energy and Reduces Your Energy Bill. Tankless Gas Water Heaters has a substantial reduction in energy costs to the user, up to 50% over the use of a storage tank type water heater. Changing to a tankless system results in a savings of 15-20% on your electric bill. You are paying for the hot water you use, not store! 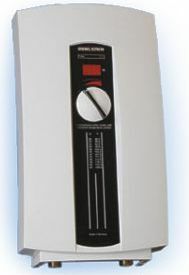 Conventional tank-type water heaters are subject to losses because of continuing to heat water when not in use. This is a huge waste of energy over a one year period. These units take up considerably less space than conventional tank type water heaters and saves valuable living space. Proven Reliability Backed by a Three Year Warranty. These electric units have an enviable track record for engineering excellence and product quality. The three years parts warranty is unique in the industry. You can depend on them for many years to come. Elite International Company, Inc. hereby warrants the tankless gas water heaters to be free from defects in material and workmanship within 18 months of the date of purchase. The gas units have a 15 year warranty. There is no need for preventative construction, as required when using a conventional tank-type water heater. Large, Heavy and clumsy to handle. Small, light and easy to install. Can easily run out of hot water. Never runs out of hot water. Takes up valuable floor space. Hangs on a wall - saving floor space. Stores warm water - a perfect breeding ground for bacteria. Stores only cold water, reducing the risk of bacteria growth. Has an average lifetime of only 2-9 years. Designed and built to last 20+ years. Efficiency declines annually due to mineral build-up. 82% efficient for life of the heater. Natural gas/liquid propane energy factor of .52 to .62. Natural gas/liquid propane energy factor of .69 to .84. Electric energy factor of .80 to .90. Electric energy factor of .99.